John Opiyo is an energetic, vibrant young man who hails from Gulu, Northern Uganda. Another one of the very cool people I met at the High Level Youth Policy dialogue last week that was held at the UN offices in Nairobi. His energy when addressing human rights issues is magnetic and one cannot help but notice him in the room. I had the pleasure of joining John for lunch on one of the days and he gave me a little insight into his life. His words, when I asked how life was like in Gulu were, “I keep getting threatened,” as he chuckles and smiles. To say that he’d caught my attention is an understatement! John tells me that this interesting phase in his life began when he decided to advocate for his community’s rights. Battling it out is more like it. 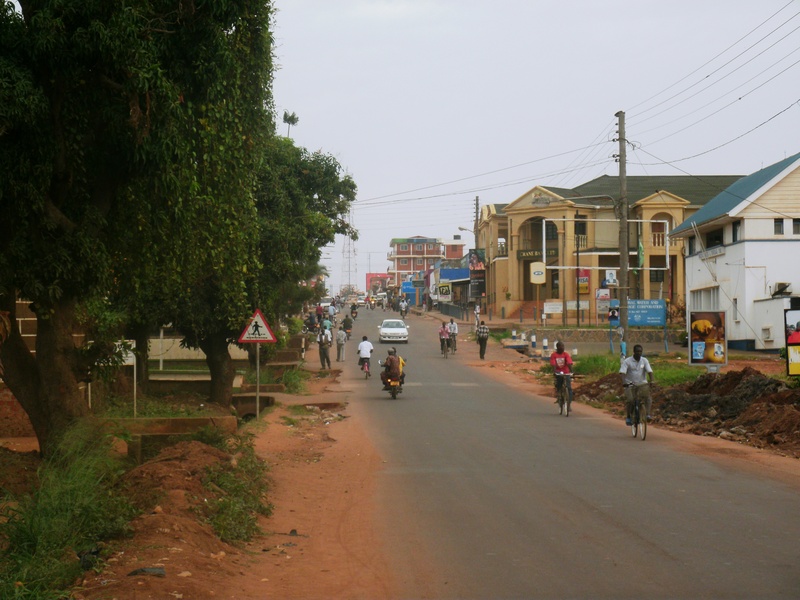 As most of us know, Northern Uganda is a region that had been plagued by internal war, terror, child kidnappings, displacement and poverty for the longest time. The atrocities are unmentionable. These are all rooted from the counter rebellions against Yoweri Museveni, led by Joseph Kony from the Lord’s Resistance Army. My mind wanders off to whether this is the source of the threats..
John continues to engage me in conversation and alerts me that the threats are not from any militia group but from an international NGO based in Gulu. The genesis of this is when John began interacting with the community on a personal level to which he uncovered astounding facts. He discovered that the NGO had been giving out aid money in exchange for money from the community. What he said did not make sense to me yet what is so disheartening is that it did to the community. Reason for this is that the community lives in such abject poverty that they do not know any better when it comes to receiving donor funding. The mandate of the NGO was to enhance development in the area however in the scheme of things, they had made the entity a money making machine. If this was not bad enough, the NGO created a false data system which recorded invisible children who were receiving substantial amounts of aid. Which brings us to the threats; John states that on his own initiative he began educating the community on their basic human rights; what they should expect from the government and what they should expect from an NGO setting camp in their town. He has since sued this organization which has resulted in him receiving several ‘intention to sue’ letters on charges of defamation and libel. He reiterates that there is dire need for a legal system that supports anti corruption in his country. What is worrisome is that the youth in this community have given up and see no point in challenging the state on meeting their needs, let alone challenge the NGO through the judicial system despite knowledge of their misdeeds. It is admirable to see that John has decided to take it upon himself to challenge these NGOs one at a time or all at once depending on how quick he uncovers evidence. This week he is in court challenging this particular NGO that he narrates about but highlights that there are couples more. The zeal that this young man has is remarkable! I then ask him what he intends to do if the government fails to meet his needs and aspirations. It seems that this question jolted a nerve in him as he tells me that African youth need to wake up! The future rests with them yet they are very much asleep. There is a current shift at the global scale and there is fundamental rewriting of territories and states for example, the Arab spring. In Sub Saharan Africa, youth and majority of the population have remained poor and some governments, so as to remain relevant, have maintained the status quo. 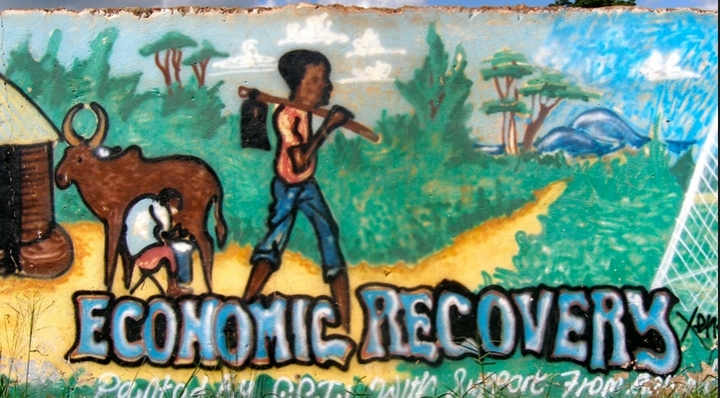 In the least developed communities, abject poverty has been a driving tool for garnering election campaign support. 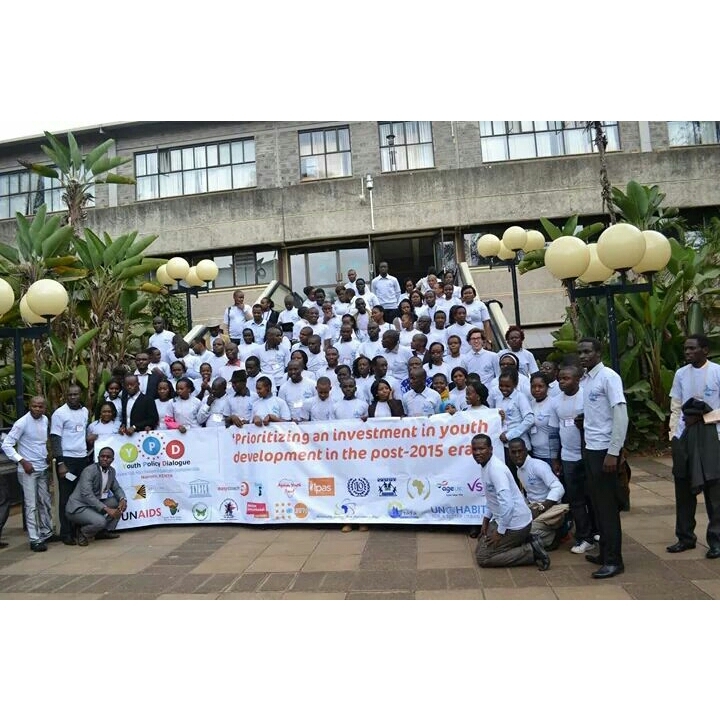 If the youth had access to information and understood their basic rights, then they would hold their governments accountable on all levels. John and I agree that there is definitely need for a shift in the mindset of young people. It is estimated that by 2030, nearly one in four young people in the world will be African. This presents Africa with an enormous opportunity but it could also present a significant risk and substantial threat to social cohesion and political stability if youth do not understand this and if governments fail to create sustainable livelihoods for them. 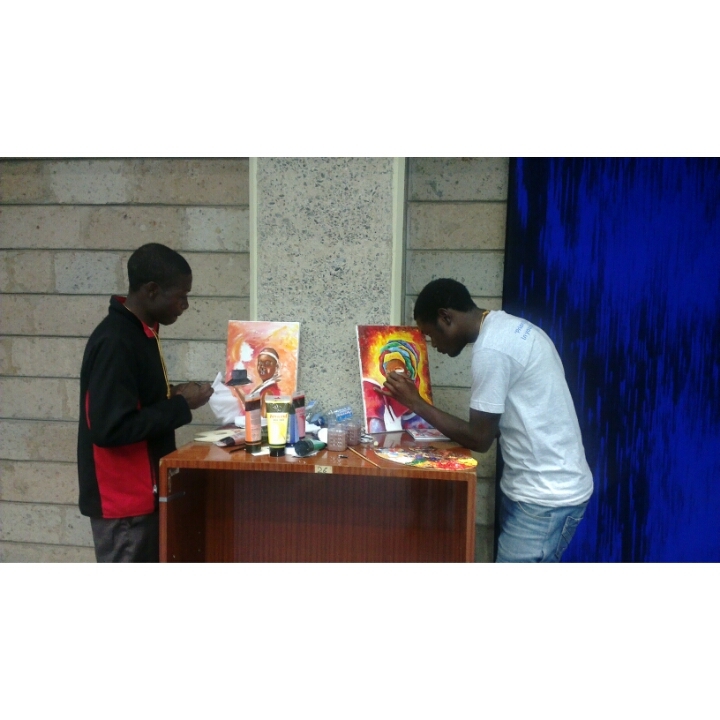 I had the pleasure of meeting the coolest guys last week, Dan and Victor, both budding artists from Kenya. The two were showcasing their work at the High Level Youth Policy Dialogue on SDGs at the UN. To say that their work is amazing is an understatement! Stopped by to marvel at their pieces as well as have a short conversation with them. Dan tells me that he has been painting for only a year now which comes as a huge surprise while as for Victor; he can barely remember when his love for art came about. He states that he was a very little boy. They tell me that they’re both in school and that painting is their favorite past time. Fortunately for them they get to sell their pieces from time to time. This then brought me to the question of whether they would do this full time or as a part time hobby and subsidiary source of income when they’ll have completed their studies. Both of them seem pretty unsure of this and this nudged me to ask them on what they would do better or what could be done better to make their answers a resounding yes. Dan feels that art should be reintroduced into the school’s curriculum. He knows he would be a much better artist if this was the case. “I want people to want my art more, art needs to be taught in schools again,” he states with such strong conviction. In Victor’s opinion, he wishes that there were more art institutions that would enhance and complement his talent, he wishes for more mentorship and an access avenue to showcase his talent. “Not everyone is cut out for office jobs and one can get an income without having to rely on anyone for a job,” he quips. This brings me to the question. Are our policies enhancing and strengthening the creative’s industries for development? To begin with it has been proven that with arts being included in school curriculums, it boosts self esteem among youth and enhances communication skills. It also increases cultural understanding, enjoyment, a sense of achievement and identity amongst other attributes. I am a product of the 8-4-4 system and I have my strong views on it. In my opinion, most of it taught me how to cram and to look for a J.O.B rather than learn how to use my talents to create wealth and employment. I do resonate with Dan as he says that art needs to be reintroduced in schools. Without a doubt the creative industries is a fast growing economic sector that holds enormous potential for youth and countries as a whole. From an economic perspective; it promotes economic diversification, revenues, trade expansion, innovation and contribution to employment. Creativity is a strategic asset that can offer a comparative advantage in the globalizing world and help maintain a country’s cultural identity. The creation of new products opens up access to global markets and would leap-frog any individual and country into new areas of wealth creation. According to UNCTAD, the creative industries sectors of the developing economies have significant potential to contribute towards the achievement of 5 out of the 8 Millennium Development Goals. The creative economy has a multitude of dimensions and it contributes to economic, social, cultural and sustainable development in a number of ways. The tangible and intangible cultural capital of a community, a nation or a region of the world is something that must be preserved for future generations just as natural resources and ecosystems need to be safeguarded to ensure continuation of human life on the planet. Despite the abundance of talents, the creative industries in Kenya and Africa as a whole are relatively small and very fragmented. Art as Dan and Victor muse is a multi-billion-dollar business, and it should be seen not only from a cultural perspective but also as a profitable economic activity responsible for creating jobs and generating revenue and export earnings. There is need for effective public policies to be put in place to harness the potential of the creative economies. I do commend all the organizations in the public or private sector that are actively advocating, marketing and enhancing public awareness on the importance and potential of the creative’s industries. 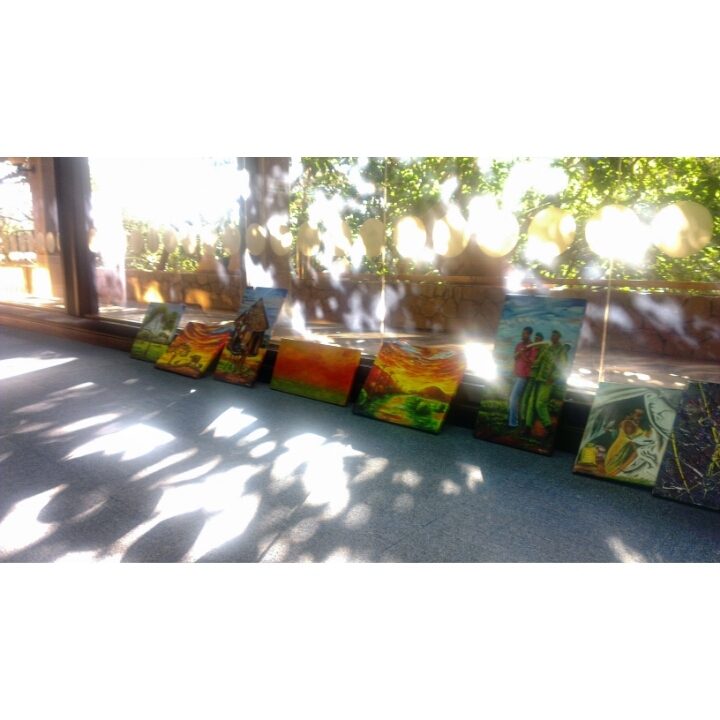 However, there is still need for an increase in knowledge and appreciation of Kenyan and African art as a whole.